Are you overstressed? Overworked? Overcommitted? Overtired? Do you struggle to achieve career success while maintaining a peaceful home and happy children? 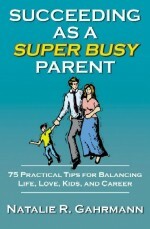 Learn how you can have more success as a super busy parent. …the resource for every parent with too much to do and too little time. …a straightforward approach to everyday questions and challenges faced by working parents. …a tool that you’ll keep returning to time-after-time for tips, practical advice, and solutions you can use in your own life. …your guidebook for effectively creating more fulfillment, joy and balance in your super busy life. Volume discounts available for bulk purchases. Ask about how you can include personalized intro page from your CEO, President, VP – Human Resources! 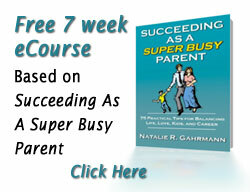 Finally, a workbook that’s a hands-on companion to the award winning book, Succeeding as a Super Busy Parent, by Natalie Gahrmann. This product is a tool that offers a variety of exercises to help you gain clarity and direction while boosting your self-confidence, personal fulfillment, professional success, and work/life balance. 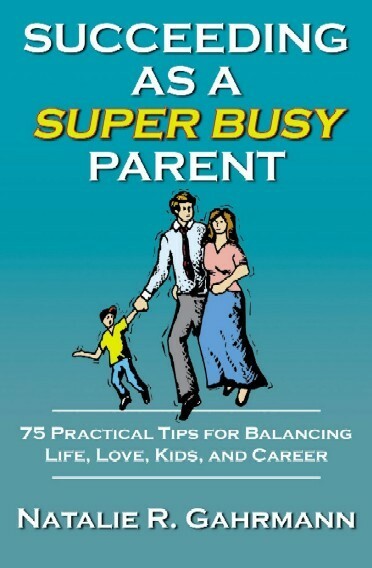 It provides an opportunity to further explore and understand the seven proven keys to success outlined in Succeeding as a Super Busy Parent. With the same clarity and assurance Gahrmann’s fans have come to appreciate, this individualized workbook teaches readers to fully internalize the seven keys to success through private and thought-provoking exercises, whether you are already familiar with the principles or not. The Super Busy Parent Personal Workbook will help you set goals, improve relationships, and create a path to effectiveness for work, life and parenting.